This tasty scallop recipe looks truly amazing served up on black amuse bouche plates. It is a great recipe to serve in high end restaurants or upscale party events. 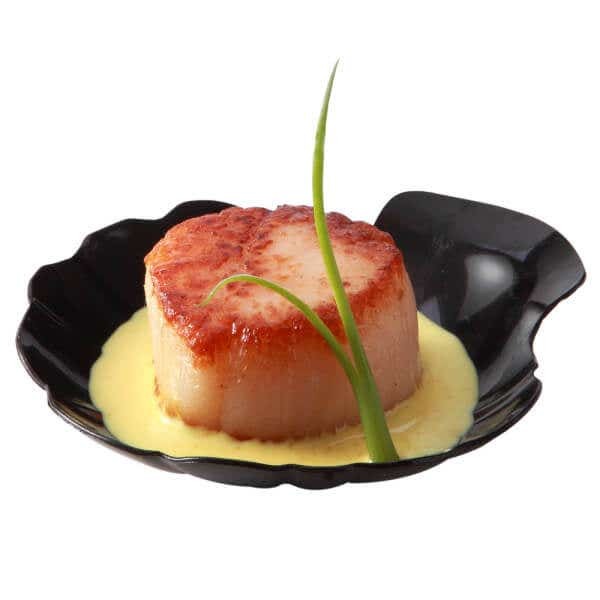 Plus, black amuse bouche plates complement the scallops perfectly so order some plates, get your ingredients and whip this tasty treat up tonight. This beautiful black amuse bouche plate can help you create fabulous food presentations. Put white wine, vinegar and shallots in a large saucepan, then cook until the liquid is almost evaporated. Now, stir in heavy cream and let the mixture come to a boil, then cook until the cream reduces by half. Stir in butter (put butter in a little at a time until it melts, than add a little more until you have used all your butter), then turn burner to a very low temperature, just enough to keep the cream mixture warm. Now, preheat broiler to 350 degrees, then brush scallops with olive oil and salt and pepper, put scallops on broiler pan and broil for 2 minutes per side, then place a tasty scallop on a lovely black amuse bouche plate. Top each scallop with some of the cream sauce you made and serve.